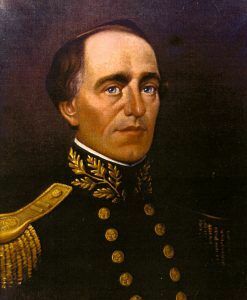 (1812-1853) – Born in New Hampshire in 1812, Gunnison became a Second Lieutenant of topographical engineers after graduating from the United States Military Academy. After serving in the Florida War of 1837-1839, he spent the next ten years surveying the lakes and harbors of the great northwestern United States. While working in the Salt Lake City region he befriended the Mormons and acted as a negotiator in several uprisings between them and the local Native Americans. Winning him the admiration of his peers and giving Gunnison confidence in his abilities to deal with the Indians, it would later prove to be the death of him. In 1853 he was charged with finding and surveying a railway route from the Mississippi River to the Pacific ocean. After moving along the Kansas–Nebraska border, his journey took him over the Rocky Mountains, and into the Gunnison River Valley. Working with a guide from Taos, the pair, along with the rest of Gunnison’s party, came into conflict with Ute warriors on several occasions, but Gunnison was able to appease them and move on, further boosting his confidence in dealing with the natives. However, as he and his party moved into Utah, locals warned them of recent trouble with the Paiute. Overconfident in his abilities to negotiate with the Indians, he divided his crew into two groups before going around Lake Sevier. It was a fatal mistake. The next morning, October 26, 1853, a band of Paiute, seeking revenge for the killing of their chief, ambushed and killed Gunnison and all but four of the eleven members in his group. Gunnison’s route through the fabled Black Canyon of Gunnison was never used for a transcontinental railroad; however, the information he gathered throughout his career would later provide extremely useful in the development of the west.